So head on over and check out the post about me! You know the drill ... leave a comment to be eligible for the giveaway. I will leave the contest open until around 5PM EST tomorrow (Tuesday, March 31st), after which I will use the Random Number Generator to select the winner. Good luck, and remember to visit the Stitchin' Heaven Howdy for your chance to win another prize! Wow, am I really the first one? Just found your blog and love it. How great to get to know men who are loving to quilt. I find that's so great. Would be happy to win your great give-away. You are so talented!! These are so beautiful!!! And they would go great with our new couch that is on its way. Please enter me to get them!!! Yeah, Katie Jump Rope. Your kids look like they're loving the Spider Web quilt. did you tell them that's what it's called? ooh what a lovely giveaway! I adore Katie Jump Rope. Congrats too on being part of the Tribute to Male Quilters. Totally cool! I am in for the giveaway. I think you definitely needed to be featured with the other quilter men. You are so talented. Ooh, how fun! Who knew there were so many male quilters out there? I think I have 3 guy quilter blogs inhabiting my Google Reader - and you definitel post the most, John. And the giveaway is great too - gotta love the Katie Jump Rope! Hey! How are things in NC? Really enjoy reading your blog...when do you find time to sew? Three little ones are a handful - they are so cute! I like your style - it's very straightforward. Keep up the good work - and thanks for the inspiration. I love that fabric line- so cute! Thanks for all you inspiration- you truly are amazing! you know how much I love Katie jump rope, you know those pillows would be loved in this house - enter me!!!!!!!! Congrats on being part of the tribute to male quilters. I can't think of a more deserving male quilter than yourself! I love Katie Jump Rope! I think it is great that someone recognized the wonderful men quilters! 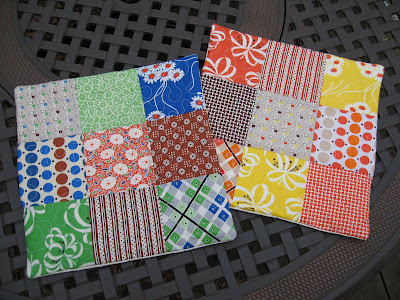 Ooh, I love the Katie Jump Rope fabrics and these look great. I would be so pleased to own these. Those are so cute! I have seriously tried to talk my husband (architect) into quilting, but I don't think he's going to give it a try. Too bad--he'd be great at it! My seams are always really crooked!! That was my first comment and I just didn't do it right did I? Our very own John, a quilting celebrity. How way cool. Congrats on being part of their feature! That's awesome! I can't remember how I found your blog, but I really enjoy reading it. You are an awesome quilter. I LOVE the Katie Jump rope line. I am actually making a quilt using it. The pillows would compliment it beautifully! I am hoping some of your give-away luck will rub off!! I hope I win! Love the pillows. I love those pillows. And that spider web quilt is awesome. Lucky you. I think male quilters are awesome! Beautiful!! I love that line! I haven't aquired any so far, but I should really find it before it disappears. 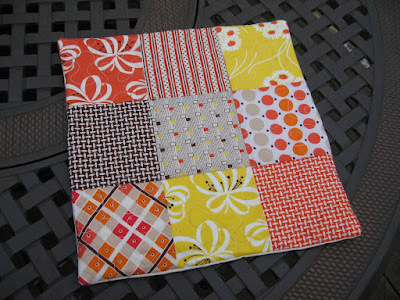 Congrats on the male-quilter-blog-love! I love that you and your wife sew together. I love Katie Jump Rope. I hope it will be my randomly lucky day - plus think how much you'll save on postage if I win! 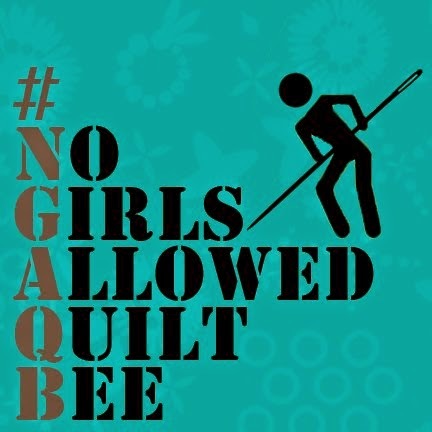 Looked through Nicoles's blog - what a great idea to highlight male quilters. Thanks for the inspiration! I love reading your blog and think you are super talented! The pillows are great AND the fabric is awesome...nice job! Who doesn't love Katie Jump Rope? Thanks for doing this, I love your blog! Ooooohh, I just love that Katie Jump Rope line! I'm keeping my fingers crossed! i, too, am on a lucky streak...so throw my name in the hat, please. That is so cool that you are among the group of male quilters. You certainly do deserve it. Haven't heard much about your dog lately. . . are things going well? From the looks of it you might have a hard time getting the Spiderweb quilt from the kids. I love Katie Jump Rope! That's fantastic to be included with other male quilters - rock on, dudes! please pick me. i think i would be able to fight this nasty cold better if i could lay my head on those dreamy pillows. plus i think quilt dad is the coolest. Awesome! I'm so happy you will be highlighted on their blog! It's a great shop and you'll be in great company. PS - the pillows are fab as well! Wow, great giveaway, and what beautiful pillow covers! I have a quilt out of the same fabric (also with patchwork squares) and these pillows would match perfectly! I would love those pillows!!! They are great. You're a very talented quilter and I always love what I see on your blog. The pillow covers are gorgeous. Great blog! I love those pillow covers! That orange is perfect for Spring. Cute, cute, cute fabrics!! Congrats on being a part of the Tribute to Male Quilters! Those are great! :) So dang cute! Those pillow covers are fantastic! I love the Katie Jump Rope fabrics. I wish I knew male quilters around here (or even men who could tell the difference between a sewing machine and a serger!). I'm behind the times, didn't know about Katie Jump Rope. My quilt group uses more traditional fabrics. Reading blogs like yours helps me a little more current. ME TOO! I never win these things, But I keep trying!! Hope your well! I would love to win. I just love your blog and all of the awesome stuff you make. Oh I hope I win. fingers crossed. Beautiful! I love Katie Jump Rope! Congrats on your feature story, you deserve it! what a lovely givaway - they are so pretty and would look great in my baby boys nursery. Thank you for the chance to win and a lovely inspiring blog. Cute pillows! Fingers crossed here. Congratulations, I've been following your blog for quite a while. You do amazing stuff! I have a brand new linen-colored couch that would be a great place for these pillows. Congrats for being featured on Stitch in Heaven. I'm off to check out the feature now! Pick me, random number generator! I think I'll be 61. Loved the interview on Stitchin' Heaven. Great pillows. Hope I win!! Hey, you're a web-lebrity. Yea, I made that up. 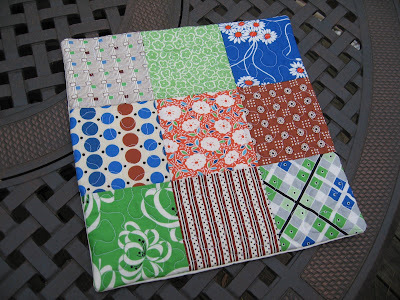 Just go ahead and put those pillows in w/ the simply charming mini-quilt....save some postage! These are so pretty! Thanks for the giveaway! I love your blog!! I come here everyday to see what new post you have. You and your wife do such a great job and give us great ideas! thanks for the chance to win something. congrats on the spot light, you sure deserve it. Very talented!! What a great give away. I love everything you do...I get ALOT of inspiration from you! I love those pillows. I think you are a great quilter. I check out your blog all the time for inspiration. Keep sharing with us. I'd love to win a pillow - count me in! Oh lovely!! I love the Katie Jump Rope fabrics! Thanks for this lovely giveaway. Love your pillow and fabric choices. Love a chance to win! I love Katie Jump Rope. My favorite color is orange. Of all the members of my family, my son is probably my muse. He is always asking me for the most improbable items like a quilt shaped like a surboard, a balaclava that has war paint, etc. I taught him to crochet this year so he could make a tunic for his high school Beowulf unit. Count me in John. I love those fabrics! I recently made a quilt for my hubby for our wedding anniversary out of all Kaffe Fasset fabric scraps - and called it 'Blokey Beauty'. He loved it. A friend of mine who stitches bags for a living says it's important to him that his boys see him work, so they get it that sewing is a technical skill, not a girly craft. Recently, my 10 year old and his 10 year old asked to make swimming bags for themselves on my sewing machine - what a coup to get their attention in this way. I have shown your blog to them and they think it's great! Maybe we'll have some 'textile engineers' of our own in the future. So, you can be a role model to people across the globe whom you've never met - cool, eh? Anyhow, congrats on your work. I'd love to join in your giveaway, but mostly I just wanted to see 'goodonya'! Great interview...Congrats on your much-deserved time in the spotlight! These pillows are a perfect example of your amazing work and I would be so thrilled if I was lucky enough to win them:) Thanks for the opportunity. Congrats on your interview! Well done. Keep up the great work and the wonderful blog. Love the pillows, too cute! Congratulation on the recognition. That's great news. Count me in! I'd love to win the pillows! how cute are those fabrics!! great giveaway....thanks so much for entering me!! 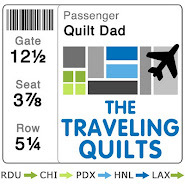 I love that you are a quilting dad. It's awesome to find some out there. I am new to quilting and just starting to find out about all the different fabrics and patterns. I would love to win your great give-away. Hi John! Congratulations! I am so happy that your quilting genius is being honored. The pillows are lovely. Please enter me to win. Fantastic post on Stitchin' Heaven... Congrats! I loved the other posts as well. You quilting men really rock! Okay, so I would love to be entered in your giveaway, very generous and very pretty! Wow, you're a quilt celebrity...maybe you'll be on HGTV on somewhere soon! Your quilting is wonderful! Yay for Dads that quilt! LOVE your quilting. You are so incredibly talented. Glad you got your mojo back! Thanks for the chance to win a great little prize. Sweet! These pillows are so perfect for my sun room. Congrats on the write-up! You rock! Congrats on your write up. The cushion covers are just beautiful. Don't you just love that Katie Jump Rope range. Hey John! Way to go...you are a great choice for Stitchin' Heaven to end their series with! I love your posts and am in awe of how much you get sewn AND blogged, Dude! You and I should do our own private "guy" BOM exchange! Here's hopin' I get selected by Mr. Random # Generator! You do amazing things. Really like those pillows ;-). Congrats on the Tribute to Male Quilter. congrats john! you don't need to enter me...i'm moving so i really don't need anything else to pack..just wanted to say good for you! Please enter me John! Tanks for showcasing your talent. The world needs more male quilters! Love the color choice on the 'Birdie Sling' by Amy Butler. My daughter-in-law chose that pattern as one of her learning to sew/quilt choices. Now she has requests to make for friends. Keep the male quilter going! My husband doesn't sew but he will help me in all ways. We've had many great converstations while he' pressing or snipping threads and I'm sewing away! ooooh oooh, pick me, pick me!! Raising hand and jumping up and down!! I just found your blog and love it. It is wonderful to see a talented quilter like yourself. I would love to win your giveaway. You obviously enjoy colours as much as I do. Really beautiful pillows...please enter me...thanks! Great website! And I will definitely thank Stitchen Heaven for directing me to your site. Thank you! ALAS, I missed it by a day. Sadness ensues: KJR is one of my obsessive fabric purchases. I could've used the whole twin thing to try to sway you to not use that silly random.org... oh well. Those are some sweet pillows! And your kids!!! I love to see fellow twins! Go, quiltin' Dad. Love it.